Listen to "Answering the Question: What is Enlightenment?" on your iOS and Android device. In the modern era, we take the concept of Enlightenment for granted. The concepts of personal freedom, liberty and the ability to think for one-self have become a personal choice and fundamental to our everyday lives. Yet in 1784, when the essay was written, the concept of Enlightenment was an emerging idea and still a vague notion to most people. What is important for the modern listener in this essay is how Kant outlines those things that discourage enlightenment as well as those things that can enhance it on a personal and social level. 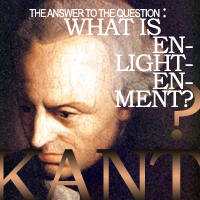 The WIKIPEDIA link below provides a more detailed analysis of the essay, although the listener will appreciate how many of the issues defined by Kant are still relevant in today's world. Amazing, always impressed by the work of this man. He has been a major influence in both my actions and thoughts, this lecture lives up to his standards, the narration is also quite apt.